In this Purple Ade e-juice review, we’ll be covering the last flavor in the Ade Juice Line by Mad Hatter Juice, Purple Ade. This is the third flavor we’ll be reviewing in this e-juice line. You can check out our previous review of the first flavor Red Ade right here, and the second flavor Blue Ade right here. This e-juice line consists of 3 different flavors, each bringing you a unique vape experience. 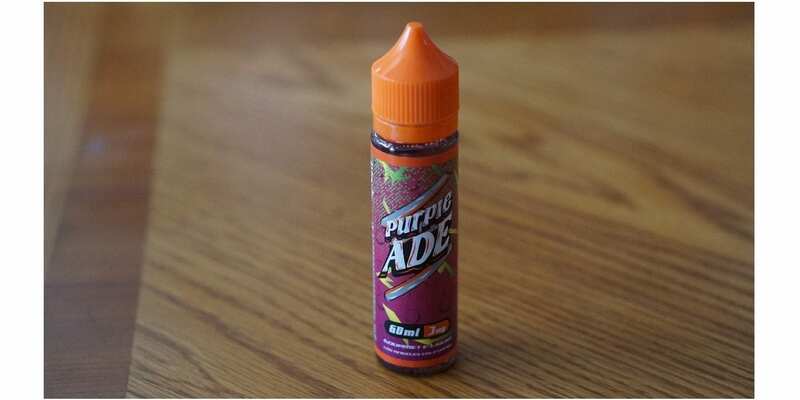 Purple Ade is available in 0mg, 3mg and 6mg nicotine strengths. In addition, this e-juice comes in a 60ml Chubby Gorilla Bottle, which is easier to carry around in comparison to 60ml glass bottles! You can select 120ml or 180ml, but it will be split into multiple 60ml bottles. Before getting any further into this review, I would like to thank Mad Hatter Juice for sending this e-juice my way for the purposes of this review. I will give you my overall thoughts about this flavor and let you know whether or not I recommend it! Remember, taste is subjective, so what I may like you may dislike and what you like I may dislike. I will first go over the specific mods and atomizers used to test each of these flavors and then will continue on to the Purple Ade E-Juice review! Click Here to Check Out Purple Ade E-Juice! Flavor Description: Punch it up with Purple Ade! Boom we’ve brought the grapes to the party. Get ready for mighty clouds in a puff of purple magic. Purple Ade is sweet and breezy like summer. Delivered in our sweet bottle we call a unicorn design it’s easy for travel and on the go. Pack a little Cali in your life with our Purple Ade. Check out the video below for a closer look at the Purple Ade! This is a pretty smooth grape flavored e-juice. I haven’t had many grape flavors, so it was pretty interesting to see how this one vapes. I must say, it is quite flavorful and my favorite of the entire Ade Juice Line by Mad Hatter Juice, with Blue Ade coming in at a close second. With that being said, on the inhale, you get a nice grape beverage flavor. It is more like a grape juice flavor, and it is quite refreshing. On the exhale, you get the same grape flavor, but it is followed by hints of other fruits. The grape flavor is the most dominant of the bunch, and honestly, I can’t really pick apart the other fruits that I’m tasting. It is a mixed fruit flavor on the tail end of the exhale, and leaves your mouth with a great aftertaste. The throat hit on this one is silky smooth, and the vapor production is excellent. Purple Ade does vape great both in a tank and RDA! This is another great vape for the summertime, as it is refreshing! The flavor description is pretty much spot on and tastes exactly like a purple sports drink. All in all, Grape Ade is an excellent e-juice that is full of flavor and definitely different than what I’ve tried before. If you’re a fan of the fruity flavored e-liquids we covered so far or maybe a fan of the other two flavors from the Ade Juice Line, then I can easily recommend this one! I hope this Purple Ade E-Juice review helps you find your next all day vape! Feel free to leave any questions or comments below! Thanks for reading!